Abby has just arrived in Summerville, Ohio, with her placid Newfoundland, Bowser. She’s reluctantly inherited her grandmother’s coffee shop, but it’s not long before she’s brewing up trouble in the form of magical baked goods and steaming up her life with an exasperating college professor. And then there is Daisy, a Web code writer, and her hyperactive Jack Russell, Bailey. Her tightly would world spins out of control when she discovers the chaos within and meets a mysterious dog trainer whose teaching style is definitely hands-on. Finally there Shar, professor of ancient history at Summerville College, who wakes up one morning to find her neurotic dachshund, Wolfie, snarling at an implacable god sitting at her kitchen table, the first thing in her life she hasn’t been able to footnote. Once upon a time, three writers decided to do a novel about three ordinary women who meet at a dog obedience class and discover they’re descended from ancient Mesopotamian priestesses and are, in fact, the embodiment of Lust, Chaos, and Ecstasy. Oh, and their ancestors served the ancient Mesopotamian Goddess of Life, Kammani Gula, whose sacred animal was the dog. And she’s just risen and needs them to serve her. In southern Ohio. The three writers considered this story their Fun Book and worked on it in their spare time. But one of the writers hit the jackpot with a completely different kind of book and her editor wanted more of those fast, so she bowed out of the project so as not to slow the other two writers down, which shows you what a goddess she is. The other two writers turned to a third who had experience in writing collaborations and was willing to write Lust. Even more important, she was willing to write with them. They met every Sunday night in a private chat room and swapped scenes back and forth and generally had a really good time on the Fun Book while writing solo books on their own. That would have be fine if they could keep a secret, but some of them can’t (cough Jenny cough), so they decided to take their collaboration to a blog, to workshop pieces of their scenes and share their Sunday chats and talk about collaborating and dogs and goddesses and invite other people to talk about collaborating and pretty much anything else that crossed their minds that was even peripherally related to the Fun Book. They realized that this book might never be published. In fact, they fully realized it might be never be finished. They didn’t care. They were having a good time. Then they sold it and finished it and got a great cover for it and a starred review in PW, and then had the blog turned into a website, and here we all are. 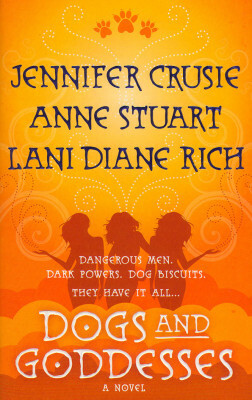 The novel is called Dogs and Goddesses, and it’s by Anne Stuart, Lani Diane Rich, and Jenny Crusie. And you can see how they worked on it (using the word “work” loosely) if you go back and read the earlier blog posts. Three writers. One story. No clue. What happens when the goddess within comes out? Dangerous Men. Dark Powers. Dog Biscuits.